Canadian Maryanne Stroud Gabbini moved to Egypt in the 80's with her husband and children. 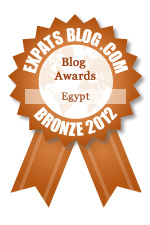 ExpatsBlog.com Expat Blog Awards 2012: Egypt Bronze Award! This blog won the Bronze Award for best expat blog in Egypt!